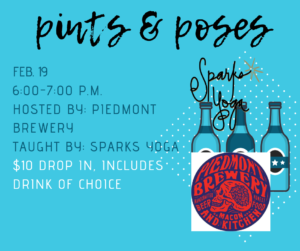 Join us for Pints and Poses at Piedmont Brewery! This event, hosted by Piedmont and taught by Sparks Yoga, is a pop up class downstairs at Piedmont. $10 drop-in rate that includes drink of choice. Bring your own mat if you have one, if not, we will provide. Show up early to claim your spot! We will be selling Sparks Specials on retail and classes at the event! All levels of yoga are welcome! Sign up at the link below to reserve your spot!